WADDY WACHTEL came to Los Angeles in the late 1960's at the request of Bud Cowsill, who saw his potential and wanted to promote the band Waddy founded in New York, Twice Nicely. Waddy soon disbanded Twice Nicely and went on to assist with the production and arrangement of the Cowsill's albums in 1970. By 1971, he had met Warren Zevon when auditioning for a tour with the Everly Brothers. Warren and Waddy went on that tour, played on the Everly's album and they formed an immediate friendship that was to blossom over the years both musically and personally. Warren wasn't the only one to recognize Waddy's talents. By 1973 Waddy was in demand as a session musician in Los Angeles, and the wave kept building as more and more people wanted to have "the guy who gets that incredible guitar sound" on their albums. Over the years, Waddy has not only played guitar and other instruments on a wide variety of albums, but has also produced, arranged and written songs with some very well-known artists. Eventually he moved into the movie arena, writing and producing scores for movies. As you browse through Waddy's credits you can click on any entry to be taken to a page that lists which other musicians, producers, etc. were also involved on those projects. Waddy has so many credits that I've separated them into decades. If you prefer, you can look up an individual artist he performed with in the alphabetical lists. You can also listen to some of the tunes Waddy has worked on, view videos of him performing with various artists and see photos by going to the pages listed in the Discography that have the words Audio, Videos or Photos. Don't be surprised if you find a few albums in your own collection he's played on that you weren't aware of. 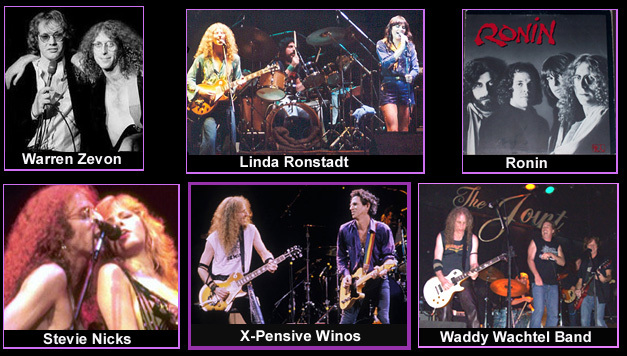 Special Note: There are some references on the internet to a person named Richard Wachtel playing guitar on the same albums Waddy Wachtel played on. They're wrong. There is no Richard Wachtel playing on those albums. It's possible someone made a typo at one point, substituting Richard for Robert (Waddy's first name), and the error snowballed.